What really excited me about reading the ingredients list for this tea is the delicious sounding ingredients! Pumpkin pieces, honeybush, cinnamon, cocoa shells, maple crystals and natural flavouring. The DavidsTea website tells me that this limited edition tea also has natural whipped cream along with pumpkin pie and maple almond flavouring. These ingredients are not on the label that was printed out at DavidsTea when I bought the tea, which is a bit disconcerting. So if you have any issues with dairy, be forewarned that this may not be the tea for you. When I opened the bag and took a big breath in, I can smell the cinnamon and a hint of maple and pumpkin. I don’t really smell anything that would scream ‘cocoa’ at me. It does smell like it would be a bit sweet, I’m really looking forward to trying this tea. I’m not usually very big on herbal teas/infusions – I like my blacks and greens! – but this one smells really good. I got a small amount of this tea just because it’s a limited edition tea and it’s new. 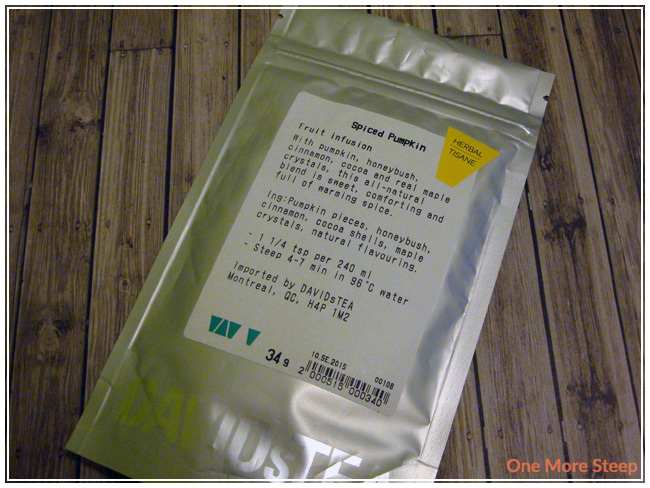 DavidsTea has a recommendation for steeping in 96C (204F) water for 4 to 7 minutes. I steeped Spiced Pumpkin for close to 7 minutes mostly because I forgot about it. While it was steeping, there was this beautiful spicy cinnamon aroma from the tea. It’s very pleasant and reminded me quite a bit of pumpkin pie, which I personally really love so I was quite looking forward to the tea. As you can see from the photo, I was using a tea bag filter – the tea filters I currently use are from DavidsTea as I have two packets that came in sets of loose teas. It smells amazing, Spiced Pumpkin is a beautiful orange-brown colour. It isn’t particularly spicy at all in terms of flavour, I definitely can taste cinnamon and pumpkin, it’s a very smooth tea. No bitterness, no astringency. I find that the aroma doesn’t quite match the taste though, it definitely smells like pumpkin pie spices but it doesn’t quite taste like it though. I wish it tasted a bit more like it smells, almost like a poorly fulfilled promise. 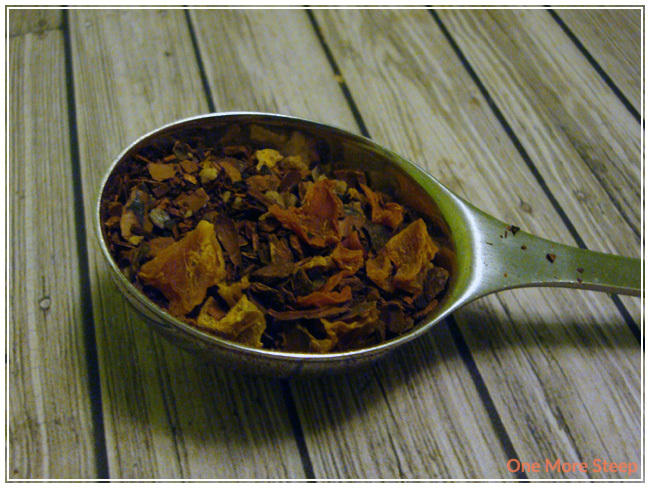 Most herbal infusions don’t do well with steeping again – Spiced Pumpkin is no exception. I thought that DavidsTea’s Spiced Pumpkin was just okay. It smells amazing, but the taste just doesn’t do it for me. If the taste had been a better match for the amazing fragrance from the tea as it steeped, I would have given it a higher rating. It’s a decent tea, but the taste compared to the pumpkin pie smell was just a let down overall. I think it would do a lot better if it had a stronger spice taste to it – perhaps some nutmeg. 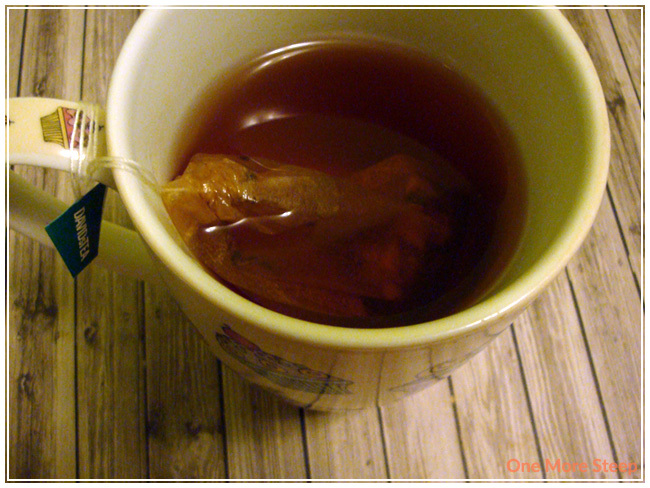 It’s an alright tea and it does okay as a pumpkin tea in general – just doesn’t hit all the pumpkin spice notes for me.